The safety of Viktor Yanukovych, his every step, is controlled by a person with a Russian passport in his pocket and undisclosed shoulder straps under his plain clothes, writes Ukrainska Pravda. The name of this person is Vyacheslav Zanevsky. He headed Yanukovych’s guards back in the summer of 2008, when he was invited to organize security measures for the then leader of the opposition. As it is known, the life of a leader of the state depends on the head of his personal guard. Due to the specificity of the work, this guard is also a close confidant. In fact, this person holds the president’s mobile phone in his pocket. He witnesses many meetings, in both official and unofficial settings, and has access to the places where secret documents submitted to the president are kept. Zanevsky accompanied Yanukovych during the entire presidential campaign. 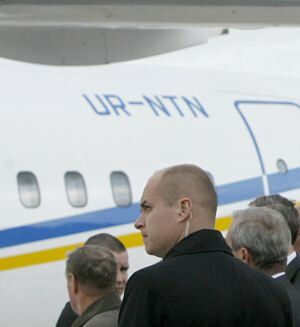 State guards provided to the ex-premier of Ukraine were subordinated to him. Kostiantyn Kobzar is the formal head of the president’s guard. However, in fact Kobzar is a subordinate of Zanevsky. While Yanukovych was an ordinary deputy, the Russian citizenship of his guard did not provoke categorical reproaches, since he was hired on a commercial basis to ensure the security of a physical person. However, after the inauguration of Yanukovych this became an issue of national security. As a Russian citizen, Zanevsky does not have the right to take any state positions in Ukraine. That is why on March 22, Zanevsky was officially appointed... a non-staff advisor to the president. Nevertheless, he is actually the head of the president’s guard.